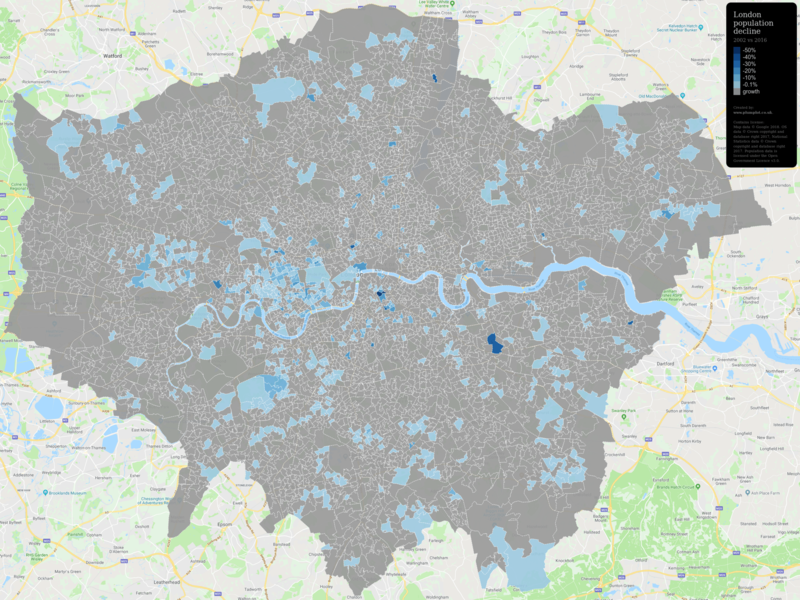 London is, after South East region, the second most populous region in the UK. But it will soon become number one, as it now holds a prime position as the region with the fastest growing population in the whole UK. 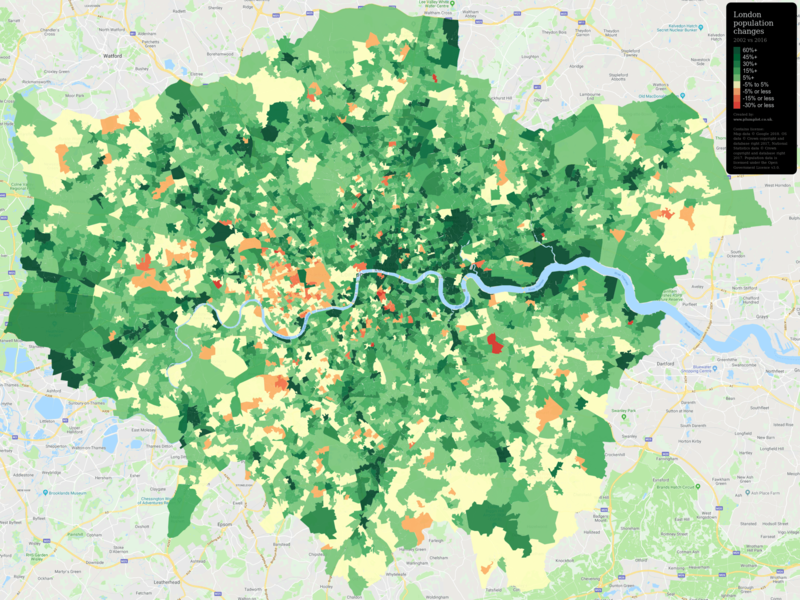 Historically, the last 100 years in London’s population growth had been a turbulent period. After several centuries of growth, the numbers peaked at 8.6 million in 1939 and then started declining for the next 50 years until the early 90s. Then it started growing again. The following map shows the population changes on lower geographical units — showing that the increase is much more variable throughout each individual district, although the majority of the areas still register population growth. London certainly attracts people by its huge and thriving job market and its open migration policy. The decreasing inward migration of domestic power is compensated by the increasing number of international one — in mid-2016 statistics, published by The Office for National Statistics, net domestic migration was -93k and net international immigration was 126.1k for the period of the preceding 12 months. However, over 75 % of London’s population growth between 2002 and 2016 accounted for natural one — births and deaths. In mid-2016 population estimates by The Office for National Statistics stated that there were 129.8k births and 48.5k deaths over the 12 months accounted — contributing 81.3k to the population of London. The next map highlights only areas with the highest population growth. 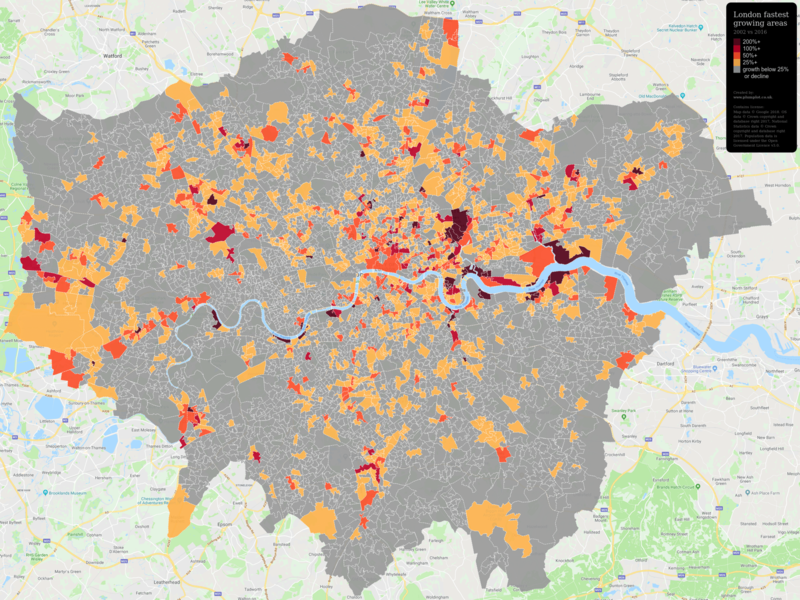 In some of them, the population even multiplied several times — notably in Newham around Queen Elizabeth Olympic Park, around Royal Docks, on the Thames foreshore close to Blackwall Tunnel and in Tower Hamlets south from Canary Wharf. 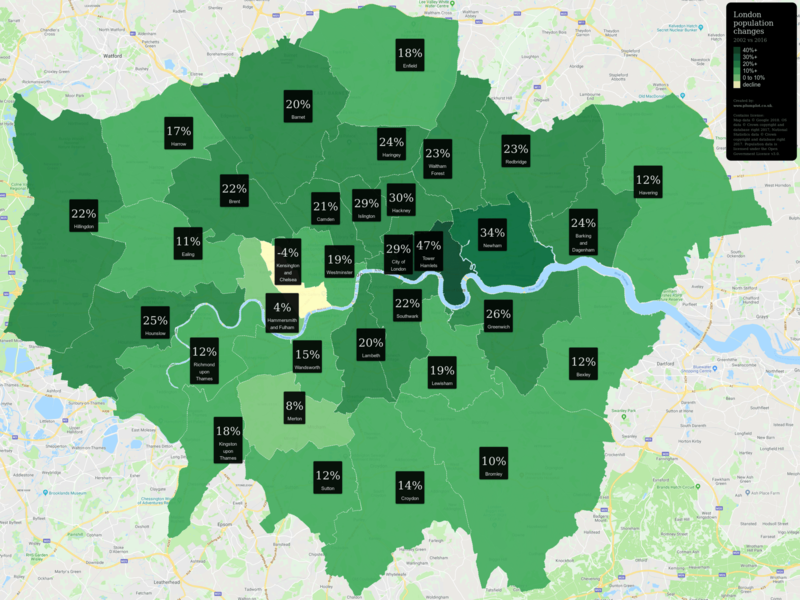 The highest growth can be seen especially on and around the Isle of Dogs and generally on the shores of the river Thames — in Tower Hamlets, Newham, Greenwich and Wandsworth. Population growth changes the city’s look. For example, Docklands transition from industrial to ‘post-industrial’ economy is the most visible transformation in the UK. The futile conditions of the Docklands in the 80’s did not in any way suggest the economic and social boom it experiences now — with the building of the Canary Wharf in the foreground, which provided the much-needed space for the growing financial centre and jobs for more than 100k people. And on the opposite side of the river, plans for nearly 15k new homes are already laid out. Riverside housing is becoming an attractive and sought-for option not only for young working professionals. On the other hand, the change brings along some negative impact as well. For example the property alongside the Thames Path, a 213-mile long pedestrian route from the source of Thames river, that’s allowing its travelers to admire some of the most iconic British sites along the way is now being privatised by developers — interrupting the riverside walkway once and for all. And the overall population growth puts pressure on services, the environment and the quality of living in the bustling centre of Britain — and as the city grows so fast, the social facilities and services in adjacent areas are sometimes hard to access or lacking at all. Contains OS data © Crown copyright and database right 2017, National Statistics data © Crown copyright and database right 2017 . Datasource: Population estimates . Other sources: The oldest and youngest areas of England, Historic population trends, How ‘new London’ developments are killing the river Thames, Privatised London: the Thames Path walk that resembles a prison corridor, After thirty years of Canary Wharf, how has it changed the geography of East London?